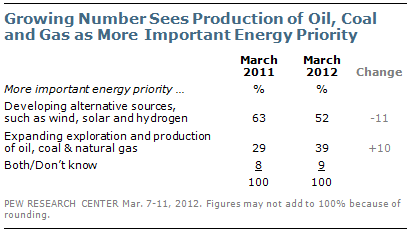 At a time of rising gas prices, the public’s energy priorities have changed. More Americans continue to view the development of alternative energy sources as a higher priority than the increased production of oil, coal and natural gas, but the gap has narrowed considerably over the past year. Moreover, support for allowing more offshore oil and gas drilling in U.S. waters, which plummeted during the 2010 Gulf of Mexico oil spill, has recovered to pre-spill levels. Nearly two-thirds (65%) favor allowing increased offshore drilling, up from 57% a year ago and 44% in June 2010, during the Gulf spill. 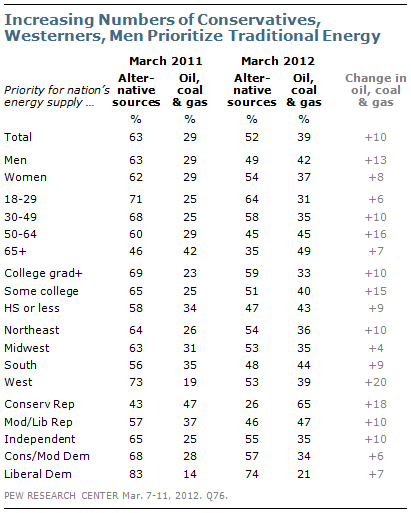 The latest national survey by the Pew Research Center for the People & the Press, conducted March 7-11, 2012 among 1,503 adults, finds that 52% say the more important priority for addressing the nation’s energy supply is to develop alternative sources, such as wind, solar and hydrogen technology, while 39% see expanding the exploration and production of oil, coal and natural gas as the greater priority. A year ago, the public viewed the development of alternative energy sources as the more important priority by a much wider margin (63% to 29%). Since then, support for expanding production of oil and other traditional sources has increased among most demographic and political groups and the shift among Republicans has been particularly pronounced. In March 2011, Republicans were evenly divided over how to address the energy supply: 47% said the more important priority was to develop alternative sources, while 44% said it was to expand exploration and production of oil, coal and natural gas. In the current survey, just a third of Republicans (33%) view development of alternatives as more important, while 59% say the more important priority is to expand exploration and production of oil and other traditional energy sources. 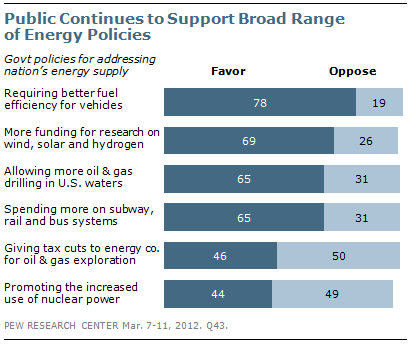 As in past Pew Research Center surveys, there continues to be broad public support for an array of policies aimed at addressing the nation’s energy supply: 78% favor requiring better fuel efficiency for cars, trucks and SUVs; 69% favor more federal funding for research on wind, solar and hydrogen technology; and 65% favor spending more on subway, rail and bus systems. But while support for each of these policies has been steady or down modestly in recent years, support for allowing more offshore oil and gas drilling in U.S. waters has increased. Currently, more than twice as many favor than oppose increased offshore drilling (65% vs. 31%). In June 2010, only 44% favored more offshore drilling while 52% were opposed. The balance of opinion today is almost identical to what it was in February 2010, two months before the Gulf oil disaster (63% favor, 31% oppose). Nonetheless, Americans are far more divided over whether the government should give tax cuts to energy companies to do more exploration for oil and gas; 46% favor this while 50% are opposed. Opinion about tax cuts for energy companies is about where it was in 2008. Support for promoting the increased use of nuclear power, which slipped after last year’s Japan nuclear disaster, has recovered modestly. Currently, 44% favor the increased use of nuclear power while 49% are opposed. 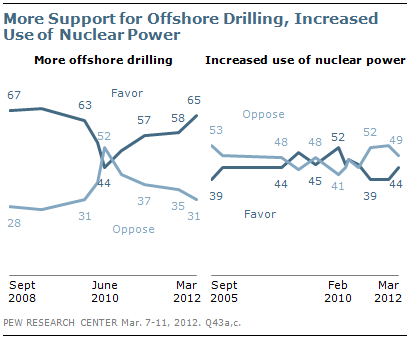 Last March, 39% favored greater use of nuclear power and 53% were opposed. The survey also finds there is limited awareness of the energy drilling method known as fracking, which is used to extract natural gas from underground rock formations: Just 26% say they have heard a lot about fracking, while 37% have heard a little and 37% have heard nothing at all. Among those who have heard about fracking, there is more support than opposition. 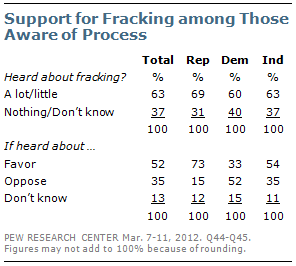 About half (52%) favor fracking, while 35% are opposed to the process. As with opinions about many other energy policies there is a wide partisan gap in views of fracking: 73% of Republicans who have heard of fracking favor it, compared with 54% of independents and just 33% of Democrats. 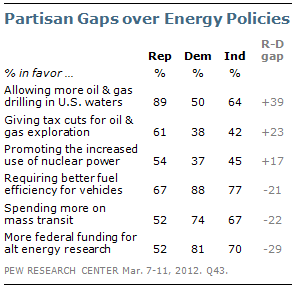 There continue to be large partisan differences in views of various energy policies. Fully 89% of Republicans favor allowing more offshore oil and gas drilling while only half of Democrats agree. A majority of independents (64%) support increased drilling off the U.S. coast. Republicans also are more likely than Democrats to favor giving tax cuts to energy companies for oil and gas exploration and promoting the increased use of nuclear power. By contrast, Democrats and independents are far more likely than Republicans to favor increased federal funding for alternative energy research, spending more on mass transit and requiring better fuel efficiency for vehicles. About eight-in-ten Democrats (81%) and 70% of independents support increased funding for alternative energy, compared with 52% of Republicans. The partisan differences in opinions about federal funding for alternative energy research and other policies are not new; last November, 83% of Democrats and Democratic-leaning independents and just 53% of Republicans and GOP leaners favored increased federal funding on research into alternative energy technology. But as recently as April 2009, there were virtually no partisan differences in views of federal funding for research into alternative energy. Over the past year, there has been an increase in the percentage of Republicans, particularly conservative Republicans, who view the expansion of exploration and production of oil, coal and natural gas as a more important priority for addressing the nation’s energy supply than the development of alternative energy sources. Conservative Republicans now prioritize traditional energy sources over alternative sources by a 65% to 26% margin; a year ago they were divided (47% oil, coal, natural gas vs. 43% alternative energy). But increasing numbers in other groups – including Westerners and older Americans – also prioritize the development of energy from traditional sources. Among those living in the West, 53% say it is more important to develop alternative energy while 39% prioritize traditional sources. Last year, the margin was 73% to 19%. In the current survey, men 50 and older say it is more important to expand exploration from traditional energy sources, by 51% to 37%. A year ago, older men prioritized the development of alternative energy sources by a comparable margin (54% to 35%). A majority of the public (63%) has heard a lot (26%) or a little (37%) about fracking, a drilling method used to extract natural gas from underground rock formations. Men, older people and college graduates are far more likely than their counterparts to have heard at least a little about fracking. Among those who have heard at least a little about fracking, 52% favor it while 35% are opposed and 13% offer no opinion. Men who have heard about fracking favor the practice by about two-to-one (61% vs. 29%). Women are evenly split (40% favor; 41% are opposed). Although young people are less likely to have heard about fracking, those who have are just as likely as older people to favor it. But there is a wide education difference in views about fracking. College graduates are about evenly split – 45% favor fracking while 43% are opposed. 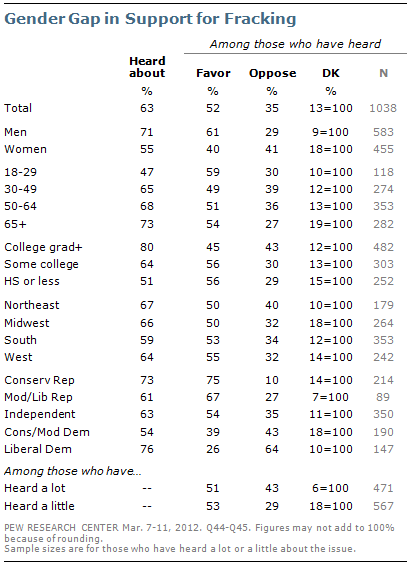 A majority of those with some college (56%) or a high school education or less (56%) support fracking. There is little regional variation in the shares who have heard about fracking, although those in the Northeast are more likely to have heard a lot (36% have heard a lot, compared with 23% in the rest of the country). Among those who have heard at least a little, there is virtually no regional difference in opinion about fracking; about half favor this across all regions. Republicans who have heard at least a little about fracking are far more likely than Democrats to favor the process (73% vs. 33%), and there is little difference in opinion among Republicans. But among Democrats who are aware of fracking, there is a wide ideological gap. Conservative and moderate Democrats are split about evenly – 39% favor fracking while 43% are opposed. By contrast, liberal Democrats oppose fracking by a 64% to 26% margin.